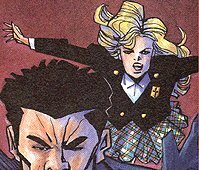 Powers/Abilities: Able to fly, can project a force field around herself when she recites the "Hail Mary", able to fire bolts of energy from her rosary. History: Catholic Girl is a teenage girl and an associate of Nun of the Above and Xombi. I don't know how she came by her powers, but given her nom de plume, she clearly views them as being a heavenly gift.